The 2030 Agenda underlines the importance of mainstreaming Disaster Risk Management (DRM) and Climate Change Adaptation (CCA) and mitigation efforts within development strategies to achieve sustainable development. As such, financing DRM and CCA should also be mainstreamed into strategies for financing sustainable development. However, financing sustainable development is only possible through mobilising resources from the public and private sectors, at the national and international levels, while addressing social, economic, institutional and governance dimensions. This requires effective and transparent public financing policies and strategies, which can only be developed using good governance principles. This article aims to highlight governance deficits that may hinder the integration of DRM, CCA and sustainable development financing strategies. The 2030 Agenda underlines the importance of mainstreaming Disaster Risk Management (DRM) and Climate Change Adaptation (CCA) and mitigation efforts within development strategies to achieve sustainable development. Indeed, financing DRM and CCA should also be mainstreamed within strategies for financing sustainable development. However, it is first important to examine challenges for financing needs and resources for sustainable development, before examining governance deficits related to the integration of DRM, CCA and sustainable development financing. Social needs: the cost of a global safety net to eradicate extreme poverty in all countries (by increasing incomes of the poorest to the $1.25 a day standard) is estimated at $66 billion annually. Large investment requirements were also identified in addressing hunger (US$ 50.2 billion annually to eliminate hunger by 2025), health (US$ 37 billion annually to achieve universal health care between 2015 and 2025), and education needs (US$ 42 billion annually to achieve universal primary education and expand access to lower secondary education between 2010 and 2030). Paying for progress: how will emerging post-2015 goals be financed in the new aid landscape? Finally, in this category, it should be recognized that the eradication of poverty requires sustained and inclusive growth and job creation. However, Micro, Small and Medium Enterprises (MSMEs), a main provider of employment, have unmet credit needs estimated as $2.5 trillion in developing countries and $3.5 trillion globally. Infrastructure needs: estimates of annual investment requirements in infrastructure – water, agriculture, telecoms, power, transport, buildings, industrial and forestry sectors – amount to $5 to $7 trillion globally. Making these investments resilient and adaptable to climate change and disaster risk may increase their cost. Global public goods needs: financing needs for the provision of additional investment requirements for “climate-compatible” and “sustainable development” scenarios (which include goals and targets related to climate) are estimated to be of the order of several trillion dollars per year. Tax evasion and avoidance, including tax evasion across borders: tax collection account for about 10% – 14% of GDP in low income countries, which is about one third less than in middle income countries, and 20% – 30% of GDP in high income countries. Tax competition: countries lower taxes in order to attract new and keep existing foreign and domestic investments, thereby reducing the pool of resources available for spending in CCA, DRM and sustainable development. Planning and Execution of the Budget: Least Developed Countries (LDCs ) and developing countries suffering from weak governance do not adhere to good budgeting principles during the formulation, approval, execution and audit of the budget. This leads to a situation where public spending is neither consistent with national sustainable development strategies, nor inclusive of environmental, social, economic, gender, and other goals. Weak governance leading to lack of lobbying to address inequalities: weak governance practices lead to 1) lack of access to the decision making forum, 2) gate keepers excluding ideas from the discussion, and 3) vested interests and sectors dominating the decision making process. This in turn implies that government financial policies (taxes and spending) do not sufficiently target the most vulnerable and the poorest from a sustainable development, climate change and disaster risk exposure perspectives. Subsidies: Energy and agriculture subsidies amount to hundreds of billions of dollars annually, which could otherwise be directed to sustainable development, climate change and DRM priorities. Sovereign debt: External debt amounted to 22.6% of GDP in developing countries in 2013, as compared to 33.5% a decade earlier. Excessive growth in both domestic and international debt in general poses risks to economic sustainability, while there are specific challenges for two groups: 1) heavily indebted poor countries (HIPCs) and 2) Small State Developing Countries (SSDC), where the average ratio of public debt to GDP in 2013 amounted to 107.7%, vs. 26.4% for developing countries as a whole. Weak governance in many countries often leads to lack of assessment and consideration of alternative debt strategies and associated risks. National institutions to support Sustainable Development: In the absence of a participatory political system, many alternative ideas are excluded from consideration before any discussions on sustainable development, including the development of public institutions and national development banks to support long term investments in sustainable development and disaster risk reduction. Short term credits: The banking sector credit is primarily short-term, particularly in poor countries with weak governance in need of long term investments. For example, in some countries in Africa, short-term credit accounts for 90 % of bank financing, vs. 50-60 % for developing countries as a whole. Domestic saving rates: Gross domestic savings rates in LDCs are significantly less than requirements for sustained domestic investment. Incentives for long term investments: Governments must develop policies to provide incentives for greater long-term investment in sustainable development by the private sector. However, this needs political will and commitment which is not always available, especially in weak governance countries, as it also needs disincentives for investments in high-risk, non-sustainable development sectors. The lack of long-term bond markets: which limits the availability of long-term financing in many countries. Institutional investors: Emerging market pension funds are estimated at $2.5 trillion, with large investments in domestic sovereign debt and in national or regional infrastructure (for some developing countries, including in South Africa, Ghana, Chile, Mexico and Peru). Lack of accounting of Environmental, Social and Governance (ESG) considerations: An increasing number of companies have signed on to initiatives such as the Principles for Responsible Investment and the UN Global Compact. Nonetheless, the share of investment subject to ESG considerations was 7% of the global capital market in 2010 (US$ 611 trillion of investments in the US$ 12143 trillion). It should be recognized that this offers an additional route for mainstreaming DRM and CCA into development. Reliance on and Shortage of Overseas Development Aid (ODA): ODA continues to provide essential financial and technical cooperation to LDCs (About 40% of ODA currently benefits LDCs), African countries, Landlocked Developing Countries (LLDCs), Small Island Developing States (SIDS), and countries affected by conflict, amongst other developing countries. However, ODA to LDCs, particularly in sub-Saharan Africa, has fallen in recent years. Furthermore, ODA does not necessarily lead to sustainable development, as the former acts as a form of rent and the latter needs the development of productive sectors. Proliferation of funds for HFA, MDG and UNFCCC: donors and funds often do not underline the same salient features in HFA, MDG and UNFCCC to developing countries and LDCs with limited capacities and resources. Large gap between financing needs and resources of international initiatives: There remains a large gap between financing needs and resources allocated for the implementation of international initiatives including the MDGs, UNFCCC and HFA. FDI not directed at job-rich sectors: Gross flows of Foreign Direct Investment (FDI) to developing countries reached $ 778 billion in 2013, exceeding FDI to developed economies. However, LDCs receive less than 2% of these flows, which are often directed at extractive industries. Furthermore, the composition of FDI appears to be changing globally, where investment in finance and real estate increased from 28% in 1985 to nearly 50% of total FDI in 2011, with a simultaneous decrease in investments in manufacturing from 43 % to 23 %. Again, this highlights the need for public sector policies strategies, with incentives for the private sector. Remittances and private flows: Private remittances from migrants were estimated at US$ 404 billion in 2013, representing more than tenfold increase from 1990. Domestic Debt markets: Foreign investors have increased their purchases of local currency debt; however, these flows are volatile, reflecting a short-term orientation of international capital markets. Missing, ignoring or under-estimating the interaction between poverty, abject poverty and hunger on the one hand; and disaster and climate change vulnerabilities and losses (particularly losses related to extensive risks) on the other hand. Missing, ignoring or underestimating the unequal distribution of benefits, exposure, vulnerabilities, risks and losses across population groups, and their variation with age, gender, ethnicity, legal status, migrant status, health, ability and general socio-economic conditions. Missing, ignoring or underestimating the linkages between non-sustainable investments, both domestic and FDI, with focus on short term returns in non-job-rich sectors, on the one hand; and risk and losses accumulation on the other hand. Failure to account for the social, economic and institutional factors that contribute to vulnerability, risks and losses. Failure to account for the interaction between the various factors that account for vulnerability on the one hand, and the main disaster risk drivers on the other hand (poverty, unchecked urban expansion, environmental degradation and weak governance and weak urban governance). Failure to identify and effectively engage the various stakeholders (including the most vulnerable population groups, vulnerable livelihoods and sectors) in the decision making forum. In this sense, effective engagement implies that ideas put forward by various stakeholders, including the most vulnerable groups, will be given its due importance in the decision making forum. Failure to try to comprehend the existing national / local science policy interface in order to develop a strategy for its improvement. Failure to rely on qualitative risk assessments, as a first step in order to strengthen the local / national science policy interface, thereby creating the demand for more accurate and efficient scientific methods. This would mirror the gradual improvement in the science policy interface that took place in developing countries over the last century. Over-reliance on supply-driven, advanced quantitative risk assessment methods being developed by large multi-national companies, without ensuring local and national ownership for the results, and without ensuring a link to the local / national science policy interface. Failure to overcome cognitive barriers and adopt a qualitative approach for the assessment of social, economic, and institutional factors that contribute to vulnerability. Failure to overcome cognitive barriers and adopt a qualitative approach to compensate for lack of sufficient data on the distribution of vulnerabilities and losses across population groups. Failure to overcome cognitive barriers and adopt a qualitative approach to capture interactions between poverty, abject poverty and hunger on the one hand, and exposure, vulnerabilities and losses arising from climate change and disasters on the other hand. Failure to develop risk management strategies that balances between preventing new risk from accumulating on the one hand, and reducing existing risk (usually accumulated in poor and marginalised areas) on the other hand, where the latter is at least as important in reducing poverty and ensuring sustainable development. Failure to balance the distribution of benefits arising from various economic activities, and associated exposure, vulnerabilities, risks and losses; thereby leading to unjust and inequitable economic policies and socio economic opportunities both of which then act as conflict drivers. Failure to monitor risk management decisions and adjust disaster risk management strategies and policies based on the outcome of previous decisions. Failure to balance between security and safety considerations, thereby diverting important resources to security-type interventions, without developing disaster risk management and sustainable development strategies. Inappropriate management of conflicts related to the use of natural resources (including water, land, forestry and mineral resources) and the unequal distribution of benefits, vulnerability and loses arising from this use. Failure of managers and decision makers to respond effectively to emerging risk and to chronic accumulation of existing risks. Lack of understanding of the complex nature of risk accumulation, and of the interaction between social, economic, institutional, physical and natural factors contributing to vulnerability on the one hand; and disaster risk drivers on the other hand. In turn this leads to a lack of appreciation of the complexity of risk management tools which need to address the above factors. Failure to identify the social, economic and institutional implications and factors needed to implement disaster risk management strategies. Failure to identify the costs required for the implementation of DRM strategies, coupled with a failure to identify potential sources, and incentives, of funding from both the public and private sectors, nationally and internationally. Failure to develop implementation schedules, based on realistic scenarios that account for existing and future available sources and incentives of funding as identified above. Failure to create a cross-sectoral platform, with all relevant agencies, to enable and expedite the implementation of DRM strategies, across sectors and agencies, in a consistent, effective and efficient manner. In the current climate in various LDCs and other developing countries, in Africa, the Middle East and beyond, security is emerging as a main threat. Officials in various aid agencies, often responsible for both security and safety, are ignoring the latter in order to focus on the former. However, these countries are in dire need of a balanced approach that focuses on both security and safety. This is particularly true in view of the drivers of violent extremism (as per the United Nations Plan for countering Violent Extremism), which are 1) lack of socio-economic opportunities, 2) marginalisation and discrimination, 3) poor governance, violations of human rights and of the rule of law, and 4) prolonged and unresolved conflicts. These drivers are very similar to disaster risk drivers, namely poverty, unchecked urban expansion, environmental degradation and weak governance and weak risk governance. Hence current practices that focus only on security, in the narrowest sense of preparing response and preparedness plans, does not address the root causes and drivers of violent extremism and disasters, which in turn implies that these countries remain in a state of “responding” to conflicts and disasters. Various international interventions are devised based on terms of reference that aim to safeguard stakeholder interests (i.e. the inhabitants of the city / country under consideration); however, weak urban and risk governance may shift the recommendations towards representing shareholders’ interests (of both local and international consultancies) leading to a shift of focus to capital intensive investments in security and major infrastructure in rich urban areas, with limited benefits to the most vulnerable and without considering the benefits of reducing extensive risk in poorer more vulnerable areas. At the international level: the development of corporate governance guidance for international consultancies to ensure governance deficits identified above are assessed and avoided. At the national level: highlight the importance of participation so the most vulnerable sectors and communities, suffering from both extensive and intensive risks, who continue to pay a disproportionate price in terms of exposure, vulnerabilities, risks and eventual losses, can make their voice heard at the decision making forum. Adopting the above would bring us one step closer for effecting positive and sustainable change in DRM, CCA and sustainable development practices. In that sense, local, national and international efforts can complement each other to effect change and move closer towards sustainable development that accounts for CCA and DRM considerations. 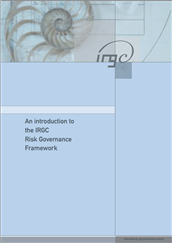 An introduction to the IRGC Risk Governance Framework. How to address Disaster Risk Management (DRM) challenges by improving linkages between Climate Change Adaptation (CCA), DRM, poverty reduction and sustainable development and growth. Organizational or institutional interests in applied disaster risk management (DRM) policy issues, internationally.